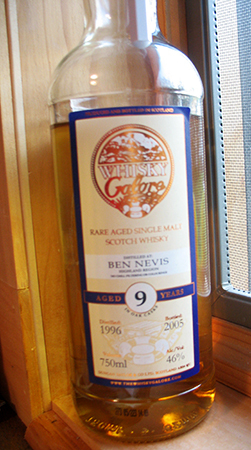 Ben Nevis, located in the Highlands, is another distillery of no great reputation. On the one hand, in such cases this means you can often find independent bottlings at very good prices; on the other, it means that you take a greater chance with each bottle, as no one is clamouring to review every Ben Nevis or Glen Moray or Linkwood or Dufftown etc. etc. that comes on the market. The bottle I am tasting today is another from Duncan Taylor’s now defunct Whisky Galore line, and was selected by The Party Source in Kentucky. I bought it on a whim and didn’t open it for almost two years because I was convinced it wouldn’t be good and I’d regret the purchase–even though it was quite reasonably priced. I finally opened it and, predictably, loved it; went back for more, only to find it was all gone. There’s a lesson in there somewhere. By the time I opened this bottle, the whisky had sat in it almost as long as it had matured in the cask. Craigellachie is yet another distillery of which I know little, except that it is a workhorse, high-volume distillery in the Speyside whose malt is available only from independent bottlers. The bottle I am tasting tonight is from Gordon & Macphail (who else) and was specially bottled for the Party Source, an excellent store in Kentucky. I have tried only a handful of the Party Source’s private selections, and while they’ve all been solid, none have truly blown me away (unlike, say, some of Binny’s–a Signatory Laphroaig 19, 1990 comes to mind, but that’s neither here nor there). On to the notes!